The Goodie Girl | living life one goodie to the next! living life one goodie to the next! I went to Chef’s Menu recently with a few girlfriends for dessert, and thought it would be a great opportunity to showcase them in a review. 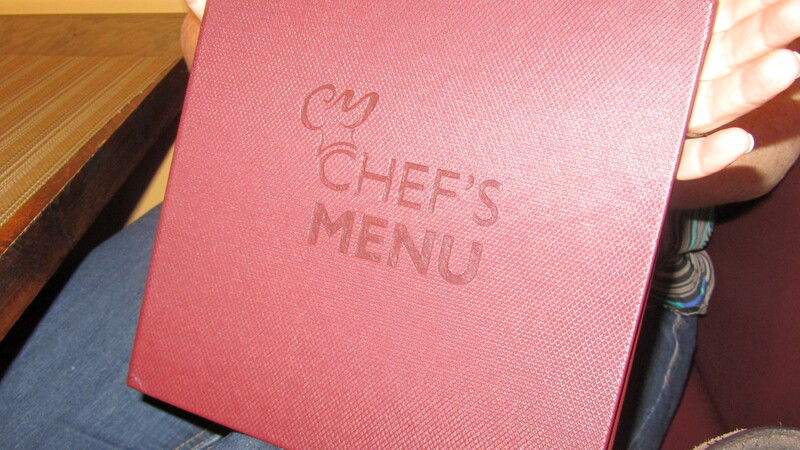 I have been to Chef’s Menu many times since it opened and have always been pleased with the food as well as the service. My friends both ordered the gingerbread and were pleased with it. 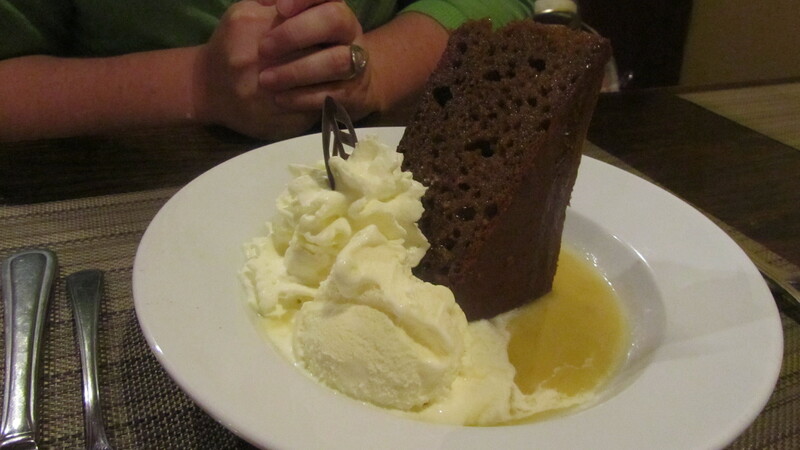 It was nice and warm served with sweet sauce on the bottom and ice cream. If you like gingerbread – this is worth a try! I have to say that I had high hopes for this carrot cake, because I was trying it the night before I knew I was going to be trying my own – so I was hoping for a few tips! Unfortunately, this disappointed me, something I had not expected since everything else I’ve had at this restaurant had always impressed me. 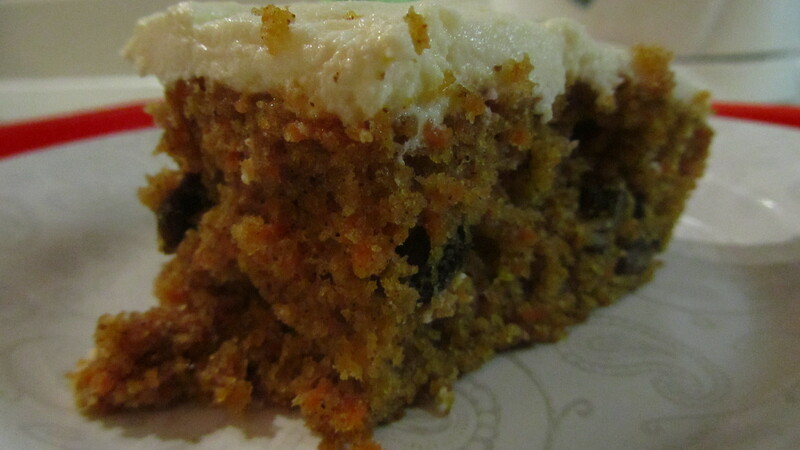 My rating of this carrot cake is 6 out of 10. I enjoyed the cake, but there was something off about the icing. I kept trying to pinpoint what about it was ‘off’ and with my friends help – we determined that the icing was just too tangy and all cream cheese taste with no sweet. Just like a block of whipped cream cheese. This will certainly not stop me from returning to Chef’s Menu, however, because everything else I’ve tried there has been excellent. Have you been there? What did you think? Leave a comment! I visited Morris East tonight because I wanted to make sure I participated in Yelp Eats – Halifax this week and I am so glad I did! I had never been there before, but had always heard people rave about it – so this was a great excuse for me to “need to go” this week (and also help support FEED NOVA SCOTIA). We started with the Vinaigrette Caeser – it was one of the best salads I’ve ever had, and no – that’s not just because I don’t eat salads a whole lot! 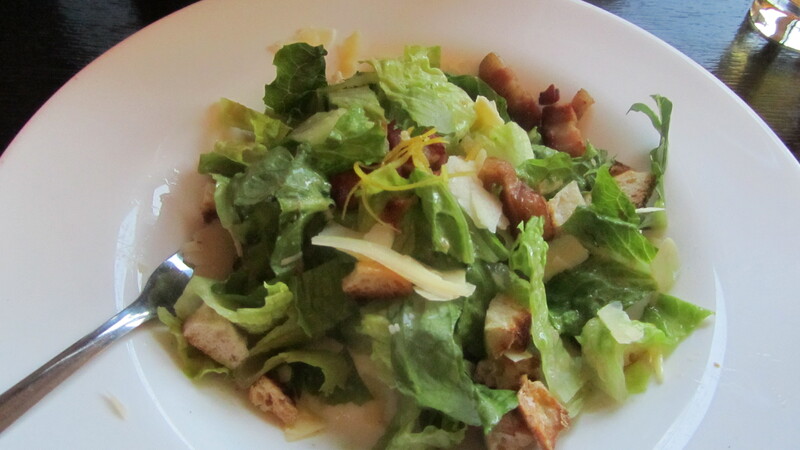 Fresh greens mixed with a very light vinaigrette, topped with house-made sour dough croutons and thick bacon pieces that were still hot! So good! I don’t normally gush about a salad this way, it’s got me all excited! After salad – we had pizza, and not just your regular, 2am craving, pizza corner pizza either! 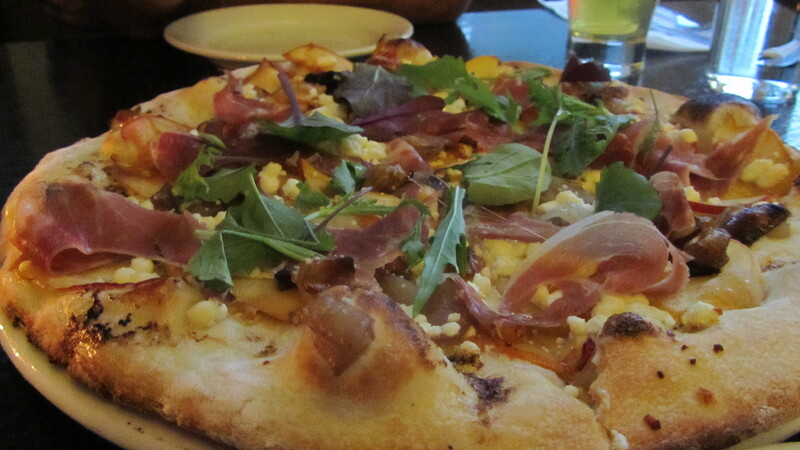 We ordered Peach Pizza – a pizza with grilled peaches, goat cheese, shallots, prosciutto and rosemary aiol. Ok – let me just say, right off the bat – peaches and goat cheese – why have I not been combining these two before?! Two of my favourite things on one pizza with the added bonus of prosciutto joining them! They tell me it is only on the menu for the summer season – so if you’d like a taste – get in there this week! And now for the desserts, last but certainly not least! 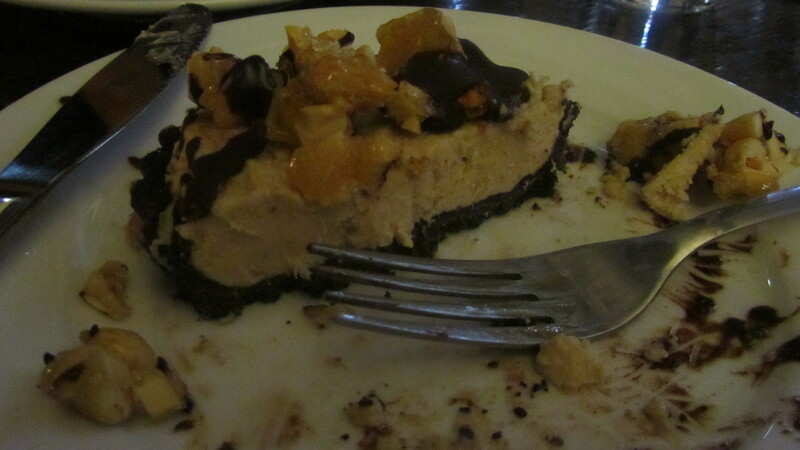 The Peanut Butter Tart with Honeysponge caught my eye, as a huge fan of combining peanut butter and chocolate! 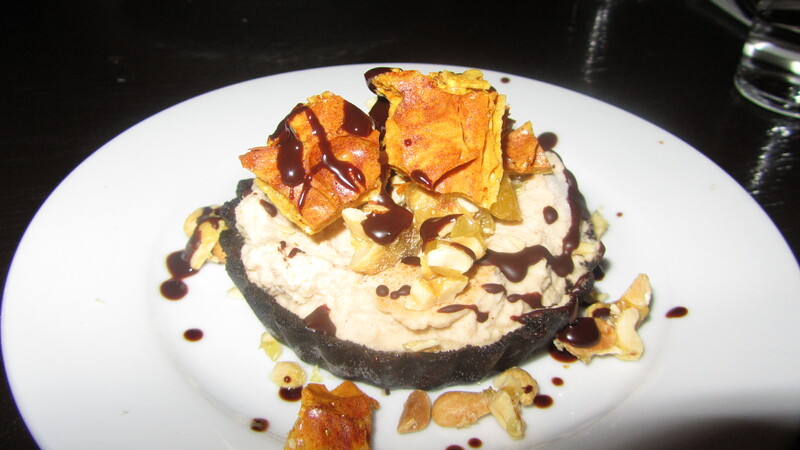 It is a chocolate tart filled with peanut butter ice cream, drizzled with ganache and housemade honeycomb. The peanut butter ice cream was the highlight for me in this dessert. While I really liked the chocolate tart too, the whole thing was frozen together, and by frozen, I mean – like a rock, you need to cut it with a knife, frozen. (yes, I know ice cream needs to be frozen) This was too bad because it took away from the overall taste of the dessert – it was just so cold and the frozen texture took away from the actual taste of the chocolate and peanut butter. That said, it was still very tasty and I’m glad to have picked it. 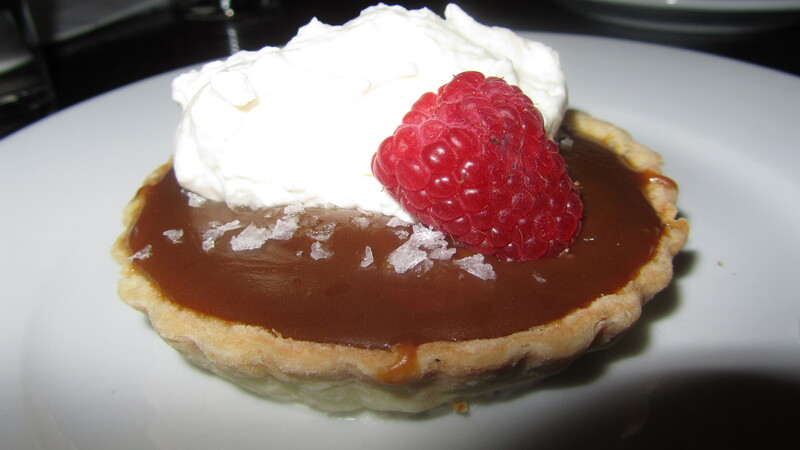 Our second choice was the Salted Caramel Tart – a lovely light crust filled with liquid caramel – a thick, sticky caramel that explodes with sweet and salty flavour in each bite! I am so pleased with my first visit to Morris East, and it will certainly not be my last! Already looking forward to visiting again! Have you been? – tell me about your experience! Have you been to any of the other Yelp Eats- Halifax locations? Here’s to a Low Stress Baking Adventure! I had a new baking assistant, Erin, (since last week’s is still out on stress leave – get well soon Niki), and she was fabulous! So here goes explaining how we successfully made three delicious desserts in less than 3 hours! We started with the sugar cookie base because I knew it would be easy and need to cool off for a while, allowing us to move onto the new recipe. *I should note that this is the second time I’ve made these bars – you know they’re good when you go back for a second taste! Preheat oven to 375 degrees. Butter a 13″ x 9″ baking dish, set aside. In a mixing bowl combine flour, baking powder and salt, set aside. In the bowl of an electric mixer, whip together butter and sugar until pale and fluffy about 3-4 minutes. Stir in egg and egg white. Add sour cream and vanilla and mix until blended. Slowly add dry mixture and stir until well combine. With buttered hands, gently press (so gently almost patting) mixture into buttered baking dish. 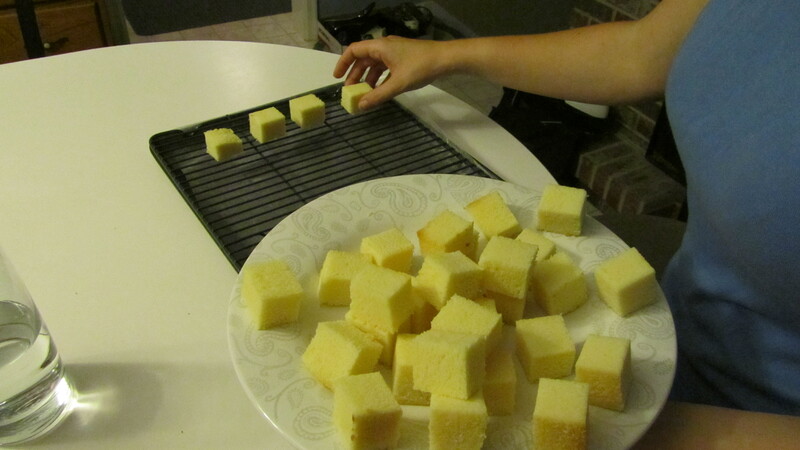 Bake 17 – 20 minutes until toothpick inserted into the center comes out clean and edges are lightly golden. 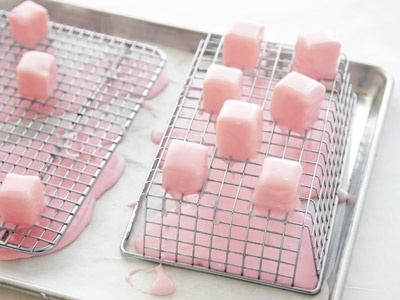 Cool completely, then frost and cut into squares. 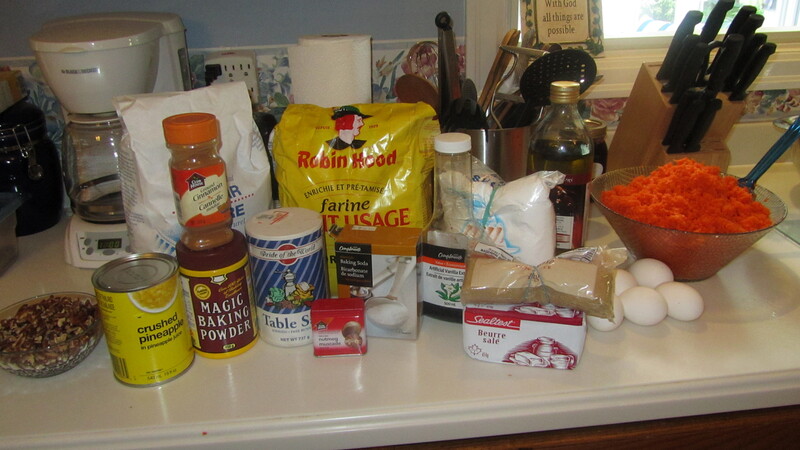 A few notes on the recipe – it will tell you to mix the sugar and butter with a mixer – maybe it’s my mixer or the butter isn’t soft enough, but I usually end up doing this with my hands to get the right consistency. When spreading dough over bottom of pan – you might think there is no way there is enough dough to spread and cover the whole pan – but it works, just keep pressing and patting it out. Combine flour, cocoa, and salt in bowl. With electric mixer on medium-high speed, beat butter and sugar until light and fluffy, 2 minutes. Add egg yolk, milk, and vanilla and mix until incorporated. Reduce speed to low and add flour mixture until just combined. Wrap dough in plastic wrap and refrigerate until firm, 1 hour. Adjust oven rack to upper-middle and lower-middle positions and heat oven to 350 degrees F. Line 2 baking sheets with parchment paper. Whisk egg whites in bowl until frothy. Place pecans in another bowl. Roll dough into 1-inch balls, dip in egg whites, then roll in pecans. 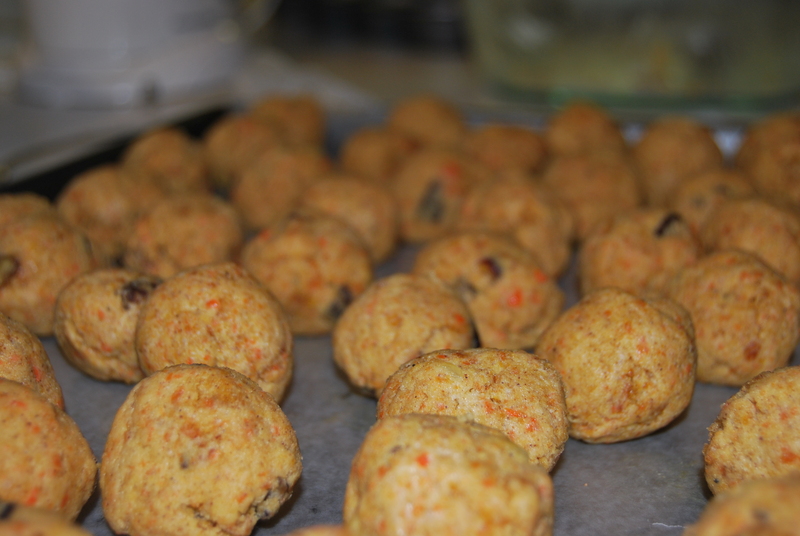 Place balls 2 inches apart on prepared baking sheets. Using 1/2-teaspoon measure, make indentation in center of each ball. Bake until set, about 12 minutes, switching and rotating sheets halfway through baking. Microwave caramels and cream in bowl, stirring occasionally, until smooth, 1 to 2 minutes. Once cookies are removed from oven, gently re-press existing indentations. 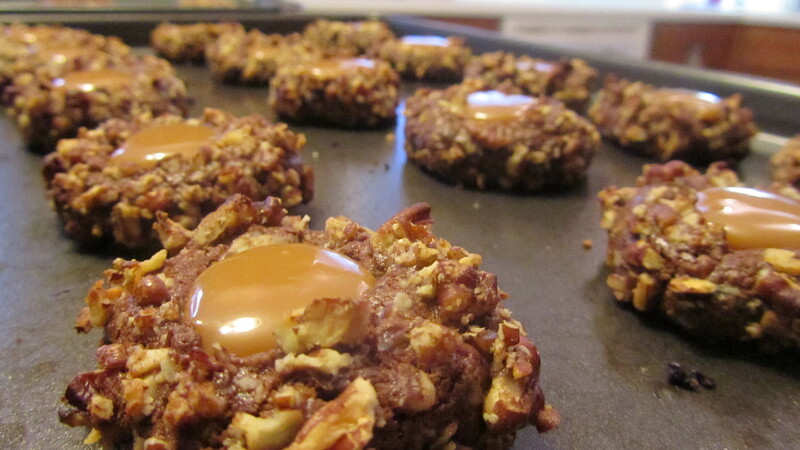 Fill each with 1/2 teaspoon caramel mixture. Cool 10 minutes, then transfer to wire rack to cool completely. Try not to devour them all at once. 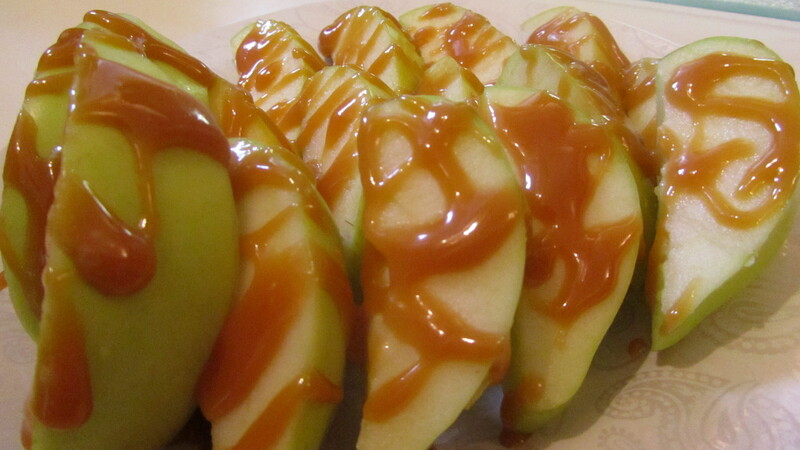 If you are like me, and made a lot of extra caramel – cut up an apple and drizzle the sauce over it – yum! Hi Everyone! This is a special post to let you all know about a very foodie-friendly fundraiser that will be happening in Halifax, NS all next week – Yelp Eats! From Sept 23-29, seven local Halifax restaurants will be participating in Yelp Eats. If you go to any of them during this time and spend $30 or more (before tax and tip) you can put your bill in the official Yelp box at the counter – for each bill submitted, the restaurant will donate $10 to FEED NOVA SCOTIA. I’m very happy to share it with you and hope you can all make it out to show support to local Halifax restaurants as well as contribute to FEED NOVA SCOTIA. If you’d like to join me or organize a group to go – I’m all for that – leave me a comment! 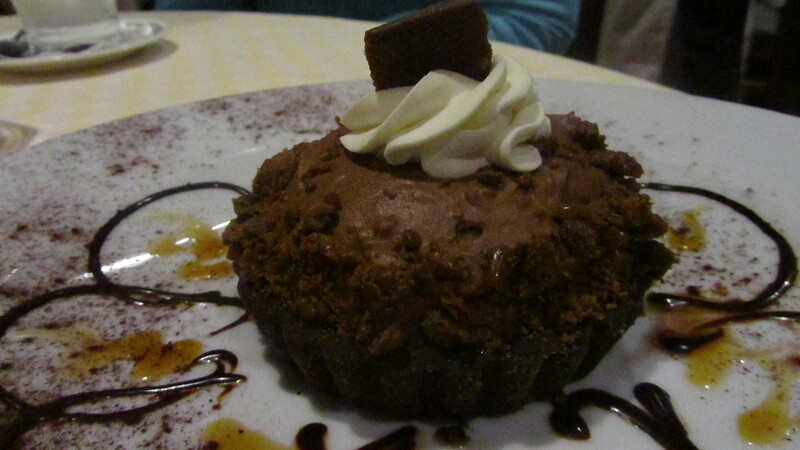 I’ll certainly make an effort to get out to a few, and will, (as usual) post my dessert reviews for you to read! Feel free to take pictures of your desserts or dishes this week and send them to me! When Life Gives You Burnt Cupcakes, Make Cake Pops! So, if you follow me on Facebook, you’d have seen my teaser picture of carrot cake, and my plans to try a new recipe this past weekend. Well, I sure did try it and it was definitely my newest baking (mis)adventure! John: “You mean you bought all these carrots?” *points to crisper in fridge filled with carrots- filled! I decided to make the recipe that Canadian Living calls The Best Carrot Cake in Canada, and because I wanted to get rid of the carrots, I decided to double the recipe and turn them into cupcakes so we could share them at both of our workplaces. Awesome idea, right? I’ve made cupcakes before, I thought, how could any of this go wrong? Well, in all fairness it all went incredibly well… until it didn’t. Things were going along swimmingly at first. 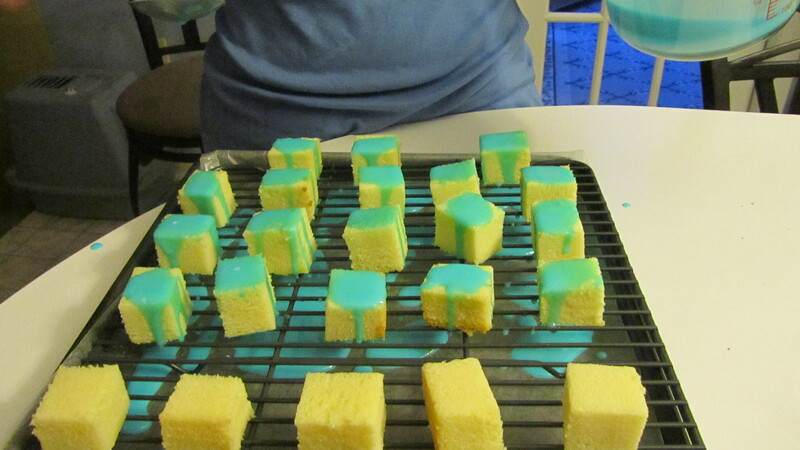 I had the first batch in the oven and was working on the icing and preparing a second batch when the first came out – looking great at first glance…. The tops looked good but the sides and bottom… not so much! I have added a few steps to the recipe here. I would not recommend adding them unless your oven plays the same tricks on you as mine does on me. Hopefully your cake will turn out just fine, but these will help you get the picture of what happened next in my kitchen. Impatiently pick at the cupcakes until you eventually get one out of the pan, only to discover the worst thing of all… the cupcakes have burned on every edge except the top! So remember each time you diligently checked on them and relaxed in the fact that they “looked good”? Be angry at those damn cupcakes for being so easily burned and that oven for running too hot! It’s ok! You’ve worked hard for this! Rack your brain for what the heck you can do with burnt cupcakes. Trifle will come to mind – but everyone knows trifle is what you make when your cake burned! Now the acceptance phase: Decide on Carrot Cake Cake Pops and send John back to the store to get white baking chips and sucker sticks while you and your friend (who did actually stick around through your meltdown and subsequent mini fight with John) get started on the inside of the cake pops. 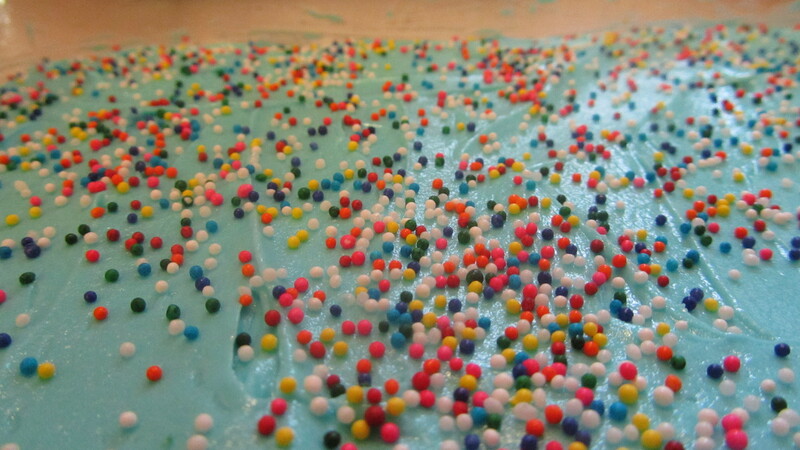 Mash up the cake so it is not clumped together anymore. Add in cream cheese icing. You’re looking for the texture of a meatball – moist and sticky, not too runny or wet. Form into balls using a tablespoon measure (that was the trick I taught you last weekend! See I’ve learned too!) so they are all evenly sized and place them on a cookie sheet lined with wax paper. Put them in the freezer for 15-20 minutes so they firm up a bit. Start a double boiler with white baking chips and melt fully stirring constantly to avoid burning. Dye it orange because you want them to look like carrots! 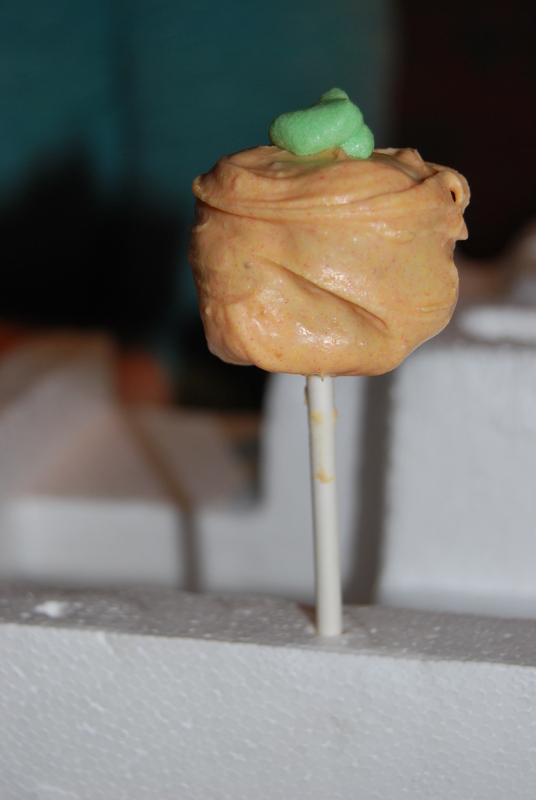 Take a baking stick and insert it into the cake ball, so it is about half way through. Dip it in the chocolate and stick in the Styrofoam so it hardens while standing up. Take some cream cheese icing and dye it green then use a piping bag or sandwich bag (in my case) to put little “stems” on each one. I must say – I know they are certainly not the most polished or professional looking but for a first try and none of the proper tools needed – I think I turned it around pretty well! And – they got rave reviews! Most people gave it a solid 10 out of 10! 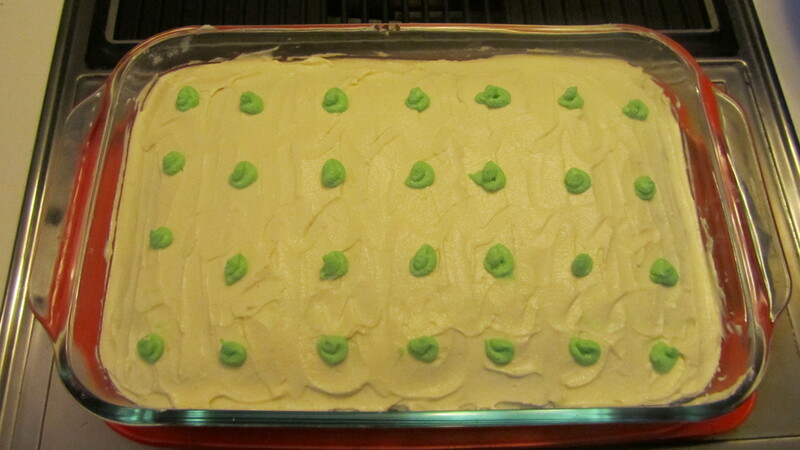 I did end up making a 9×13 cake with the rest of the batter it turned out amazingly as well – I would agree that it is the best carrot cake recipe in Canada! Give it a try and remember if the cake burns, give yourself 5 mins to cry and move on to even better, more creative things. You’ll surprise yourself at what you can come up with! 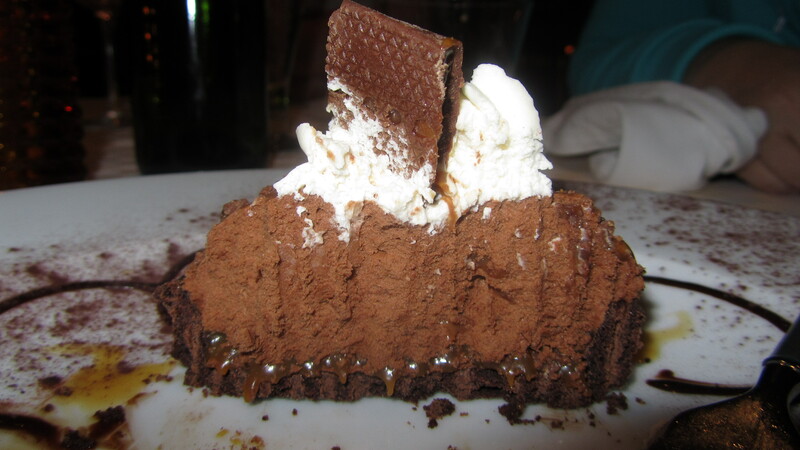 This is just a quick post – a rave really – of the chocolate caramel tart at Il Mercato. It is full of the tasty, sweet goodness that is a soft crumb crust filled with “mousse-like” chocolate, a caramel layer and topped with skor pieces! Rich, smooth and creamy – I mean look at the caramel layer dripping out! I enjoyed every bite as my friends looked on, unwilling to join in on my fun – something about being too full, after our, once again, fantastic meal. 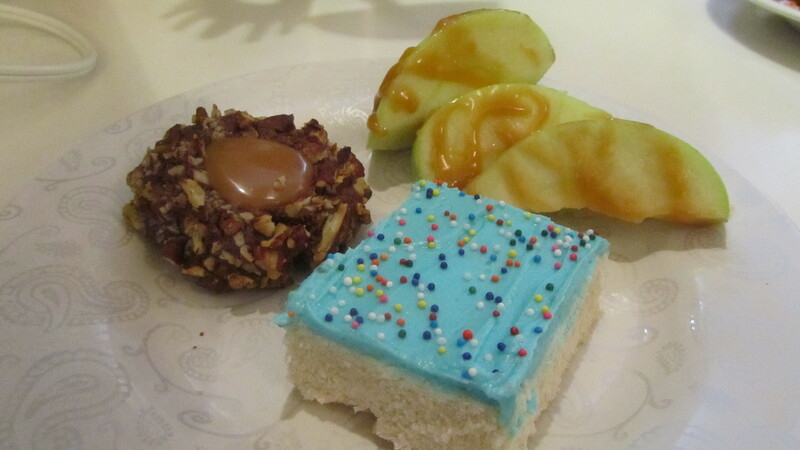 I always make the extra effort to save room for dessert, too bad they don’t have the same discipline, right? 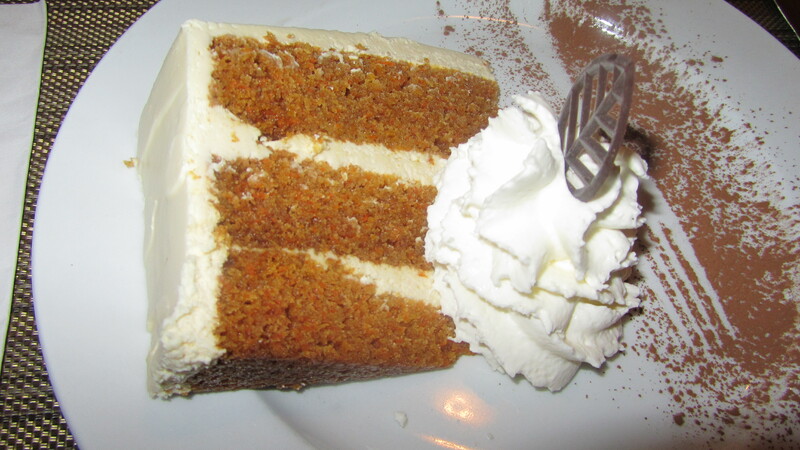 Remember – next time you eat dessert – take a picture of it and send it to me! Would I make them again? 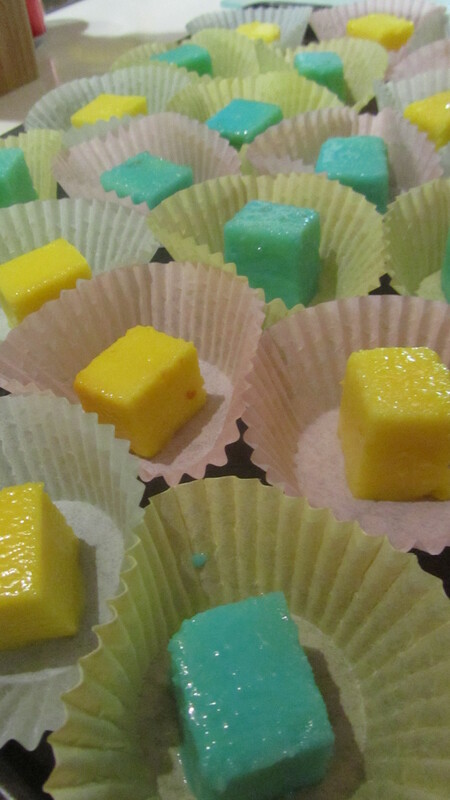 Yes, I think they add a nice pop of colour to a tray and people really liked them! FAIL…not sure what happened there! So I just dunked them right in and gave them a good coating of glaze all over (I didn’t hear any complaints!) and I think they’re even better that way. 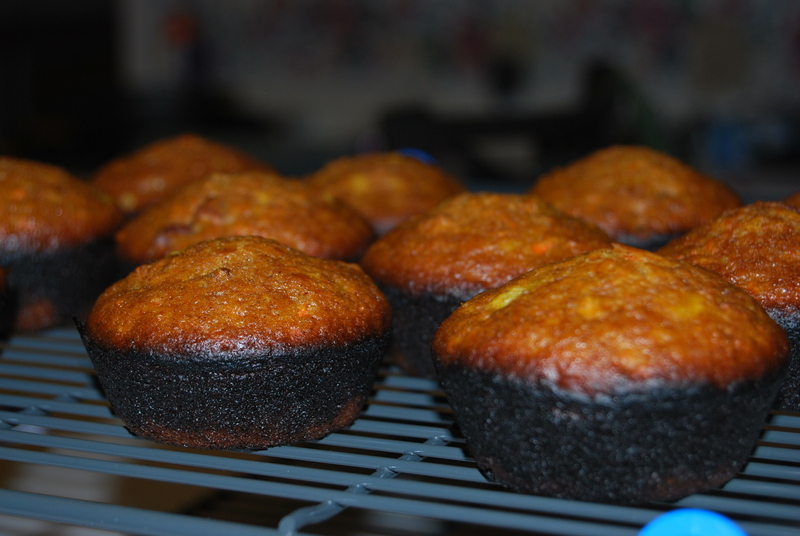 Return them to the fridge until glaze is set, then put in muffin cups and back to the fridge again! I will admit – I was not convinced these weren’t a pintrosity until the next day when they had spent a long night in the fridge and the glaze had fully set! However – once they’d been in the fridge a while (12 hours) they were just great! 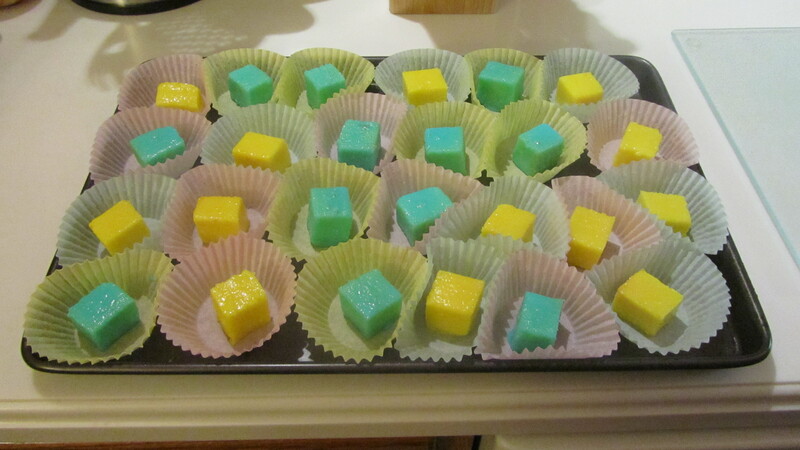 Recipe and Directions I used – they call them petit fours apparently though, they are only considered petit fours if they are glazed on just 3 sides and mine are glazed on all sides! so I call them Cake Bites! Next time you eat dessert – remember to take a picture of it first! – Send it to me with you review and I’ll post it!